Speaker Terenus is the Speaker of the Dark Brotherhood. You will first meet him inside the Anvil Lighthouse where he will give you your first task on behalf of the Brotherhood. When you approach Speaker Terenus inside the Anvil Lighthouse, he will say, "Come closer and let me look into your eyes. No remorse, no mercy. Yes, you do have the eyes of a killer. How many lives ended looking into those eyes? Enough that the Night Mother has noticed, obviously. Which brings us both to this place and time." "I grant you access to the Blade of Woe. Sharper than any other dagger you have at your disposal, it shall be your weapon just as silence is your armor." If you do not complete the quest during this dialogue and speak to Terenus again later, he will ask, "I have extended my invitation and offered a gift of worth beyond counting. Do you accept? Turning your back on me now would be most ... unwise." I wish to join the Dark Brotherhood. I accept. Immediately after completing Voices in the Dark, Speaker Terenus will offer you a new task, "Are you ready to accept the task that awaits you? To prove your worth to the Dark Brotherhood and take your first steps into the Night Mother's cold embrace?" Tell me about this task you want me to accomplish. "The Imperial noble, Lord Quintus Jarol, has been marked for death by the Black Sacrament. Your task is simple. Find Jarol and kill him." Why has he been marked for death? "That isn't a question we ask. Suffice it to say, he offended someone enough to get them to perform the Black Sacrament. The Night Mother heard the prayer and now Jarol must die. This is the task I have set before you." I'll kill Lord Quintus Jarol. "Excellent. The noble's estate can be found northwest of Anvil, along the Gold Road. How you perform the execution is up to you. Just make sure Lord Quintus Jarol dies by your hand. Then your initiation into the Dark Brotherhood will be complete." "Our Unholy Matron and the one true bride of Sithis. We are her children, forever wrapped in her cold, loving embrace." So the Night Mother is your leader? "There will be time enough for more questions after you complete the task before you. Just know that she watches you. She loves you, as she loves all her children. "The Black Sacrament is the ritual by which a client procures the Dark Brotherhood's services. Using an effigy of the intended victim, the client pleads for the Night Mother to send an assassin to end the specified life. With no remorse, no regret." So the Dark Brotherhood is a group of paid assassins. "To put it simply, yes. The lives of the innocent and the guilty alike are ours for the taking. And every soul goes to Sithis, as long as the price is paid. Death is our craft, our religion, and our trade. And business, as always, is good." Tell me more about the Blade of Woe. "The Blade of Woe is the ebony dagger of our Brotherhood. It is a single weapon, unique and powerful in the right hands. When one of our Brothers or Sisters needs the blade for a kill, it appears to help carry out the assassination." Any words of wisdom before I set out to murder the noble? "The wise traveler asks for directions before the path diverges. Never hesitate to rely on your fellow Brotherhood members once you complete your initiation. I assume you want to know what awaits you at the noble's estate?" I suppose that's as good a place to start as any. "Killing requires few special skills, but reaching your target? That's the real task, isn't it? High walls, locked gates, and armored patrols protect the estate. There is another way to reach the estate grounds, if you're interested." "A series of smuggler tunnels runs beneath the Withered Rose and leads directly to the estate's courtyard. That's the route I would take. And don't forget to bring lockpicks. Jarol is a cautious man. He never leaves a door unlocked behind him." "The Withered Rose? A small hostel outside the city. A lovely mother and daughter own the place, but they've had trouble making ends meet. The smuggler tunnels provide them with an alternate source of income. And they're perfect for your needs." When you have killed Lord Jarol, return to Speaker Terenus who is waiting for you in the lighthouse. Before you can tell him about the completed task, he says, "We know that Quintus Jarol is dead. The Brotherhood has eyes everywhere. You have done well. The covenant is sealed, signed in blood. Welcome to the family, Sister." That's all I had to do to prove myself? "We have been watching you for a long time. Killing the noble simply sealed our covenant. Now you need to meet your Brothers and Sisters. I will send you to a Sanctuary. A safehouse of sorts. A home, as well as a source of additional contracts." "Not far. It's the reason I summoned you to the Gold Coast. There is much work to accomplish here, and you will be a part of that. Your new home lies to the north, hidden beneath Varen's Wall. Go there and attempt to open the Black Door." "The Black Door will pose a question: "What is the flavor of fear?" Reply, "Sublime, my Brother," and the Sanctuary shall be opened to you. Once inside, seek out Astara Caerellius. She has additional instructions for you. "Of course. Since the formation of the Dark Brotherhood, our shadow has stretched across the entirety of Tamriel. Not every Sanctuary has flourished, however, and our grip isn't as secure as we'd like in certain parts of the world." "Not that it concerns you, but Vvardenfell continues to be a source of ... irritation. The Gold Coast, however, presents an opportunity we can all profit from. Here, we can establish a foothold that will serve the Brotherhood for generations to come." Why are you called a Speaker? "I am the voice of the Night Mother. She conveys her will to the Listener, who then passes it on to one of the four Speakers of the Black Hand to carry it out." "The Black Hand, the instrument by which the Night Mother rules the Dark Brotherhood. It consists of one Listener and four Speakers. Four fingers and a thumb. Never more, never less. The Black Hand oversees the Sanctuaries, among other duties." What happened to the woman in the chair? "Just a little business I had to attend to. I do like to keep my dagger sharp, as it were. Her family had certain documents and presumed to make allegations that might have embarrassed the Brotherhood. So you killed her to avoid embarrassment? "The Brotherhood isn't that petty, but we do have certain obligations to uphold. I gave her the greatest gift of all—solace. Just as you gave the same gift to Lord Jarol. And there will be many more gifts to grant before your work is done." How does the Dark Brotherhood respond to an attack on their own? If retribution cannot be delivered, then it is the Sanctuary that stands at fault." We'd be punished for that failure? "When the chef cuts a chunk of mold from a wheel of cheese, do you call that punishment? It's purification, nothing more." "I arrive in response to the Black Sacrament and look who I find. An interesting turn of events, don't you agree? One contract comes into conflict with another and you're caught in the middle. That makes you the ideal candidate to sort things out." "The Night Mother heard the Count's prayer and Fortunata ap Dugal has been named. Her soul is promised to Sithis now. And you will keep that promise. The Count's contract is yours to fulfill." I'm already on a contract for Governor Fortunata. "You completed Fortunata's contract to the letter. No one can say that the Brotherhood didn't discharge its obligations in that regard. Now we have a new contract, and not all the gold in Anvil can change that. The Count's sacrament is yours." Governor Fortunata won't survive the day. "Very good. Seek out your Sister, Mirabelle, in Anvil Castle. She can provide aid and advice should you need it. The secret exit in the dignitary suite is the fastest route out of this castle. Now go and fulfill the Night Mother's will." "Find Mirabelle in Anvil Castle. The Count and I have business to discuss. Your business, Initiate, is murder. Best you get to it." I've never seen the Black Sacrament performed before. "Communion with the Night Mother is a private thing. There have been exceptions, but most petitioners hide their dark desires from prying eyes. It takes a deep commitment to see the Black Sacrament through, but that doesn't mean it's always accepted." You mean the Dark Brotherhood can refuse the request? / Can the Dark Brotherhood refuse to accept the offering? "Who the Night Mother decides to answer is up to her and her alone. But when she speaks, we answer, quickly and without question." What is required of a petitioner? / How does a petitioner get heard by the Night Mother? "They must build and effigy of blood, flesh, and bone—the symbol of their desire—and drive a blade anointed with nightshade into their offering as they recite the incantation. Through this ritual, they may be heard by the Night Mother." I saw a wraith when I killed the Black Dragon. "What you saw was the Wrath of Sithis. The messenger sent to all who betray the Brotherhood. It has claimed the traitor's soul for the Void, where she will answer for all she has done. Never forget what awaits those who defy us." Could someone like Lyra ever be forgiven? "If their devotion to Sithis outstrips their indiscretion, they may overcome the wraith and be welcomed back into the fold. I have never observed such an event, but anything is possible." When approached before starting the quest, he'll say, "Assassin! The time to strike is at hand." This line does not play if you have started the quest by speaking to Grazda. "The Black Hand has studied the situation and we have devised a strategy for dealing with the Order of the Hour. We will strike first, attacking from the shadows and winnowing their numbers while you stalk our true enemy—Primate Artorius." What do you want me to do when I reach Artorius? "I want you to kill Artorius and fill the Void with his blood. Let the Order see what it means to challenge the Dark Brotherhood. Show them what happens when you hunt the hunters. But reaching Artorius will require all of your Brothers and Sisters." All of us? Artorius is just one man. "One man who hides behind thick walls and a small army. We sent Tanek to Kvatch to find a way to breach the Cathedral's defenses. Astara and the rest of your brethren will follow after you. Get to Artorius and kill well, Assassin." "Meet Tanek in Kvatch. He should have had plenty of time to find a way past Artorius's defenses so that you can enter the Cathedral. Other members of your family will join you once the way has been opened." Why has Artorius decided to go against the Dark Brotherhood? "As some in power reach higher levels, the rungs they stand upon become more tenuous. I assume that since Artorius once used the Brotherhood to rise to the top, he began to worry that someone would do the same to stop him. He decided to strike first." Artorius actually performed the Black Sacrament? "Does that surprise you? People from all walks of life seek the services we provide. Nobles, priests, commoners—it makes no difference to the Night Mother. Artorius wanted to become Primate. He asked us to remove his predecessor and we complied." How can we fight the Order of the Hour? They're an army! "And we're a collection of lone assassins. I say let them come. Let them march into our empty halls as the shadows close around them. We are those shadows, cutting them down one by one. When night falls upon the Order, it will be everlasting." Where's Astara? I expected her to give me these orders. "These orders come from the Black Hand. Besides, your Matron has another task. She leads your brethren on a hunt. To pick off the Order, reduce their numbers. They'll be at your side when you need them most. And then the Primate will die." "Welcome home, Assassin. I know what occurred but I want to hear it from your lips. Say the words and say them loud." "Then the head of the beast has been cut off. Well done, Assassin! We will reach out to Count Carolus and the Order of the Hour to make sure this ill-conceived war ends here." Is there anything else we need to do, Speaker? "Regarding Artorius and the Black Dragon? No. That threat has passed. But there is one more thing. Step back, Assassin, and prepare yourself." Terenus: "Sweet Mother, Sweet Mother, look upon your child and smile, for the unworthy have been cleansed in blood and infamyThis word is not clearly audible, and there are no subtitles that can be used to verify it.. Her heart shines with the color of night; her song sings with the music of life. Her gaze inspires fear and her hands grant the gift of death. The Dread Father acts through her, and her work has just begun." Astara: "Step forward, loyal Sister." Terenus: "Step forward, my Silencer." "You are a Silencer now, an honored member of our family. I expect you to fill the Dread Father's Void with many, many souls. Go forth, Silencer, and may your blade never lose its edge." Speaker Terenus is played by Joseph Gatt (IMDb), who previously voiced Raynor Vanos and some Altmer characters. 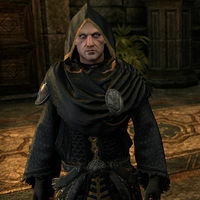 He is author of the Dark Brotherhood crafting motif. Speaker Terenus also appears in Legends as part of the The Fall of the Dark Brotherhood story. This page was last modified on 13 October 2018, at 06:18.